The weather is perfect outside today. Kyle and I just got back from a long walk with the dogs, and I could have mistaken the weather for fall. It was breezy, in the upper sixties, and there was zero humidity. I should be outside on the patio blogging, but we are currently addicted to a new show. I’m heading out later this morning for breakfast and church, but we are using up the remaining hour to fit in a new episode. If you’re looking for a new show, I highly recommend watching Ozark! 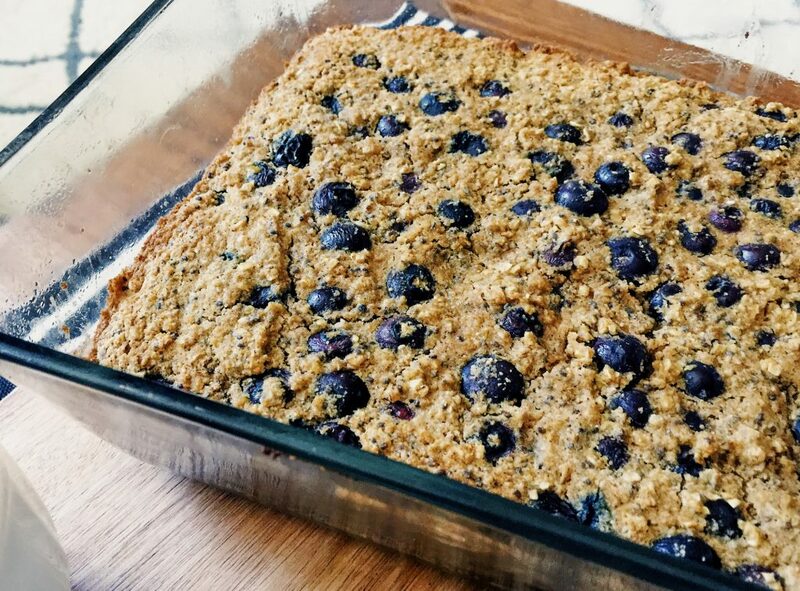 While we were binge watching Ozark yesterday, Kyle took some time to food prep for the week, and I decided to use up the leftover blueberries and make “something.” I had no idea what I was going to make before I started, and I had no plans of blogging it. 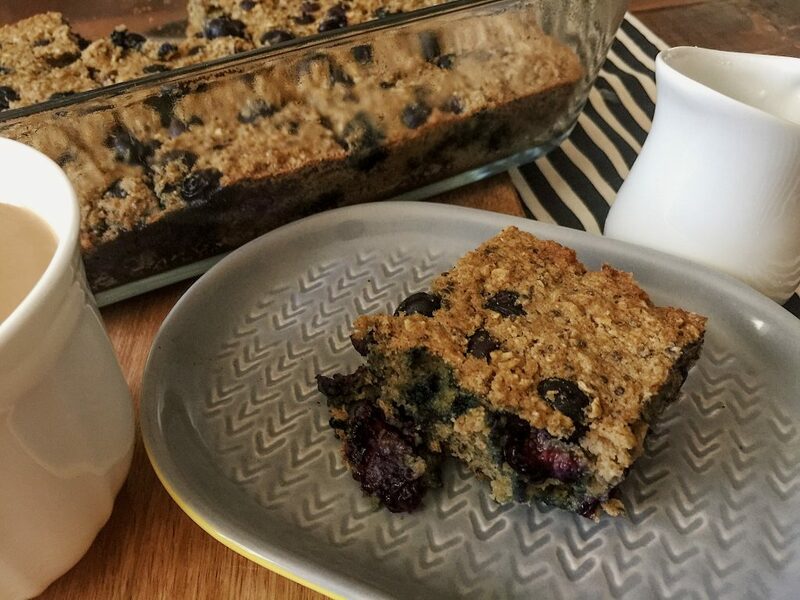 But the thing is, it turned out to be a delicious blueberry muffin bar bake, and it would have been selfish of me to not share the recipe with you. I was going to make pumpkin bars, but I’ll do that this week. I’m sorry, but I cannot wait any longer! I’m craving pumpkin! The kitchen was a disaster in my corner because I was just playing around with ingredients. 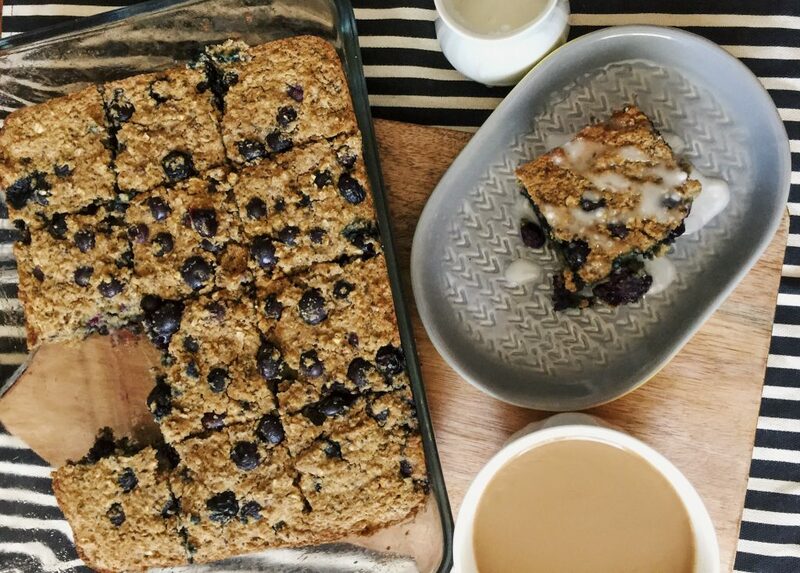 As long as you have oats and blueberries, you’re golden. 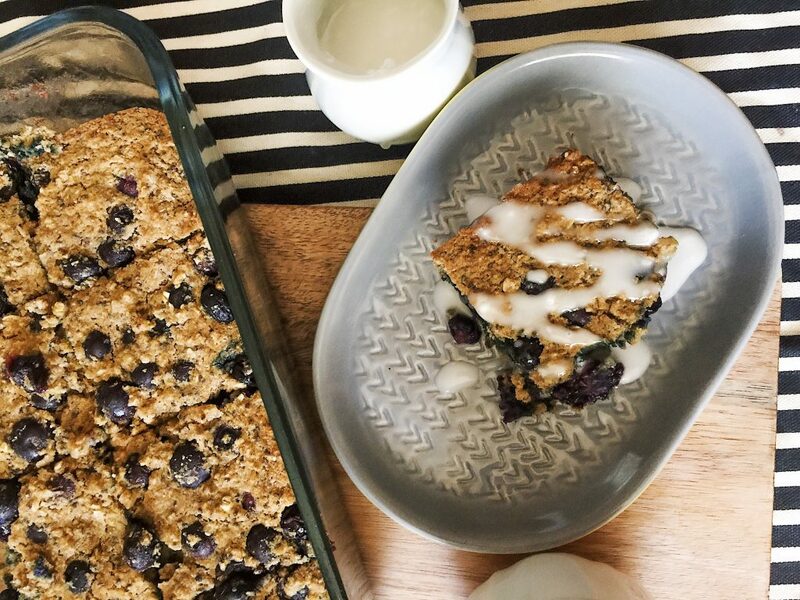 I’ve been making so many blueberry recipes this summer, but that is because they are so delicious and seem to be the only fruit that can take away my sugar cravings. I throw them into everything! They’re in my salads, pancakes, waffles, muffins, yogurt, and protein shakes. Blueberries are rich in antioxidants and filled with vitamins, so they are perfect for adding extra nutrition to your meals. It was so hard to let the bars cool down before cutting into them. 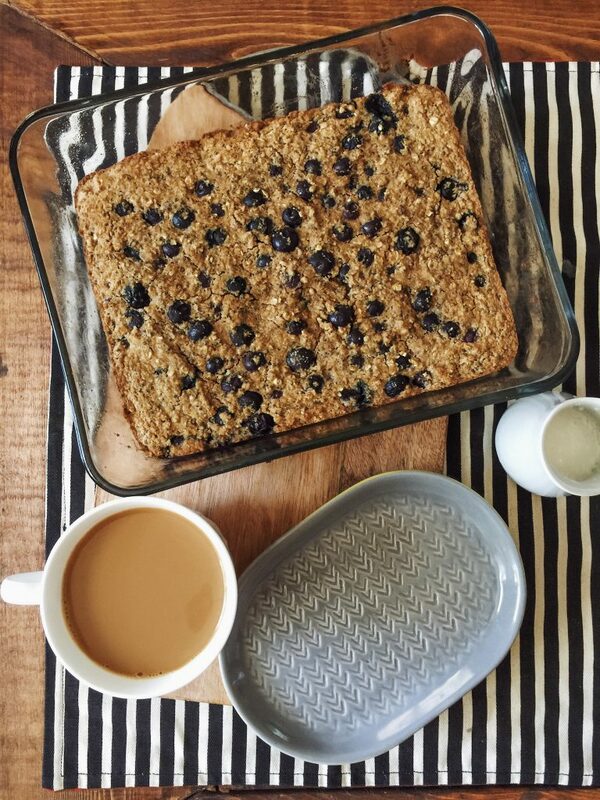 The smell of the cinnamon oats and sweet blueberries were teasing me. When I was younger, I used to get a latte and a muffin at Starbucks, or at the coffee shop I was working at in high school. I had no idea that those muffins (according to Starbucks website) had over 350 calories, 12g of fat, 55g of carbs, and 29g of sugar! A serving of Ben & Jerry’s ice cream has less sugar than that. That’s when I realized that making your own baked goods is a better idea because you can choose which ingredients you use and how much sugar goes into the muffins. Now, there is nothing wrong with treating yourself to a Starbucks or restaurant muffin at all! I still do it 🙂 I just feel better after eating healthier options. I was so excited to try them, and so was Kyle! He was hovering behind me with a “can we try them yet” face. He’s so patient while I take photos. 🙂 After he tried them, his reaction was a confirmation that I needed to blog the recipe! He LOVED them. He’s a picky eater, so that’s another good sign. When I want a sweet glaze, I like to mix protein powder, vanilla extract, almond milk, and meringue powder together for a light glaze. It tastes just like icing. 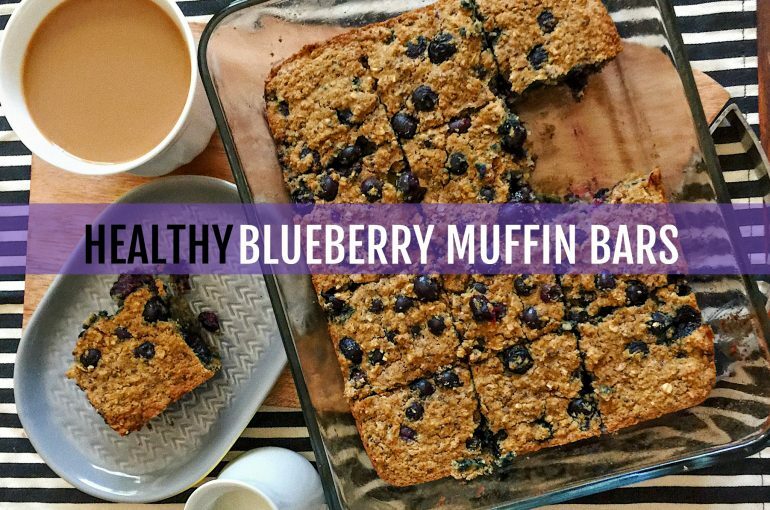 The perfect healthy blueberry muffin bars for a quick breakfast, snack, or tasty treat! Filled with extra nutrients and sweetened with Swerve! The recipe can be gluten free if you use gluten free oats! I used an electric mixer, but you can use a large mixing bowl. 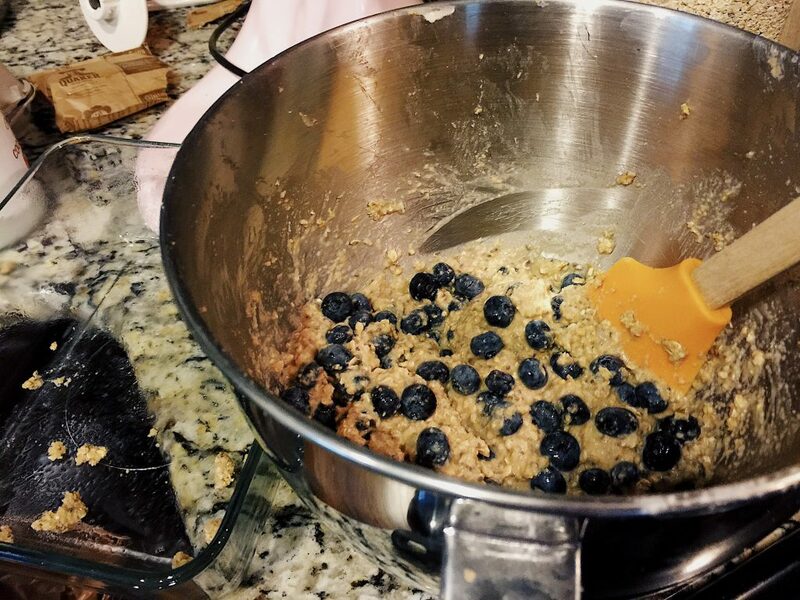 Add oats, sea salt, coconut flour, ground cinnamon, chia seeds, baking soda, baking powder, and swerve to the bowl and mix. Slowly mix in the vanilla, eggs, melted coconut oil, and almond milk in with the dry ingredients. 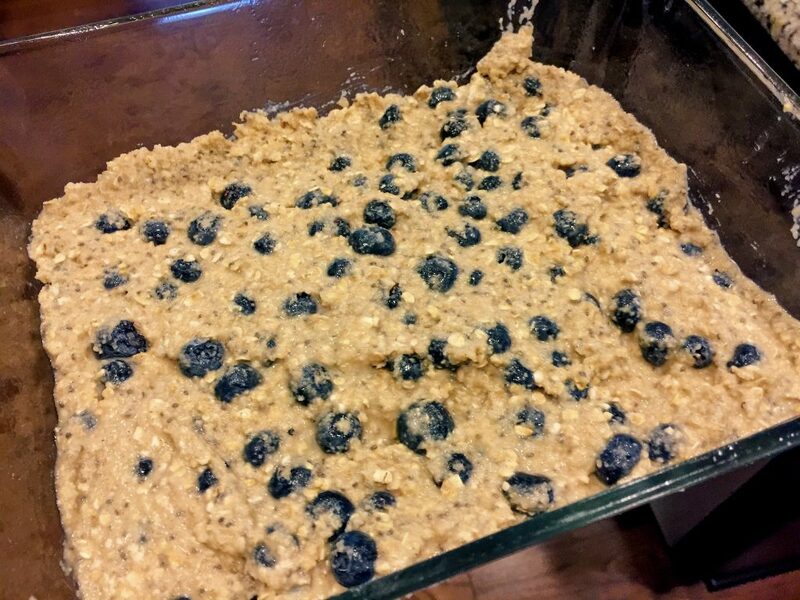 If the batter is too "runny" you can always add in more oats. Grease a baking pan with cooking spray and pour in the batter. Use a spatula and spread out the batter evenly. Bake for about 22-23 minutes. Keep an eye on it because all ovens cook differently. The sides will start to cook first, so use a toothpick to determine if the inside is fully cooked. Let the bars cool for 20-30 minutes before slicing into twelve bars. I kept mine stored in the fridge only because I love cold bars! Have you ever made up a recipe and it turned out to be amazing? Favorite restaurant inspired pastry that you like to make at home? What show are you currently binging? Ah, does it matter whether or not I use granular or confectioners swerve at all? Yum!! I was never a huge blueberry person until I picked my own. Now I love them! Have you ever made up a recipe and it turned out to be amazing? So many random dinner ideas! I just think of flavors that might go wel together & they usually do. Favorite restaurant inspired pastry that you like to make at home? Olive Gardens pumpkin cheesecake! Oh my goodness!!!! One of my favorite cheesecakes ever! What show are you currently binging? Criminal Minds from the beginning. But Ozarks is on my Netflix list! Amazing recipe. It is healthy for everyone. Thanks for sharing with us. I don’t know how to post a picture, but I made these exactly, well I had to use stevia, because I couldn’t find swerve. It cured my sugar craving! Thank you!! A recipe I will definitely use over and over and even with different berries. 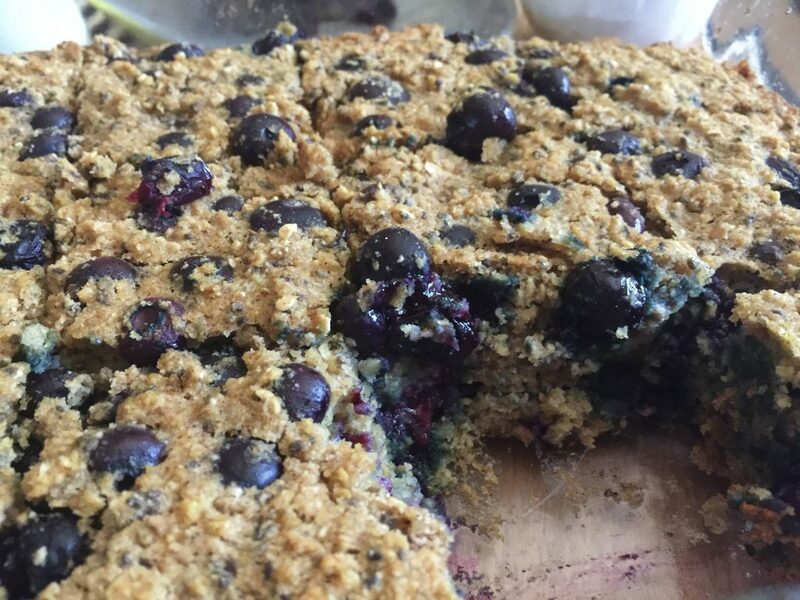 Can’t wait to make the blueberry bars…. blueberries are a fave of mine. Just finished watching One Day at a Time with my 10 year old Daughter… cute show with some real issues that are happening in the world. i pretty much make up everything as I go and then my fiancé gets annoyed because he loved it and asks me to make it again and I have NO idea how I made it LOL! we also binged watched Ozark all weekend! we finished it in 2 days it was so good! and we live in the Ozarks so that was fun as well! it was such a good show! These look delish. Can’t wait to try them. Where do you buy the Swerve? I haven’t seen it in my local grocery stores! Mine came out great! I used almond flour instead of coconut! I’m watching Ozark as well! Such a good show & thank you! I love your blog and all your food posts! I have made your banana oatmeal muffins and yesterday made the blueberry oatmeal muffins! So good! Going to make these next! I love, love, love blueberries in the summer in everything!!! I am making this soon. I just made my grocery list and added what I need. I am also craving pumpkin so I don’t blame you. We are going to have some of that cooler weather next week and I’m looking forward to it! Ahhhh lucky. I hope this weather stays! (it wont) but a girl can dream. Yum this looks so good! 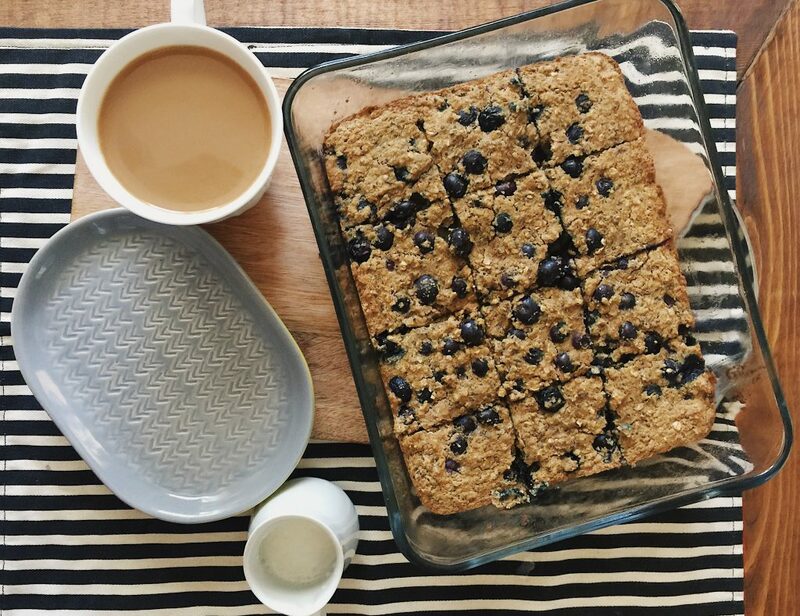 Oats & blueberries, two of my favorite things! 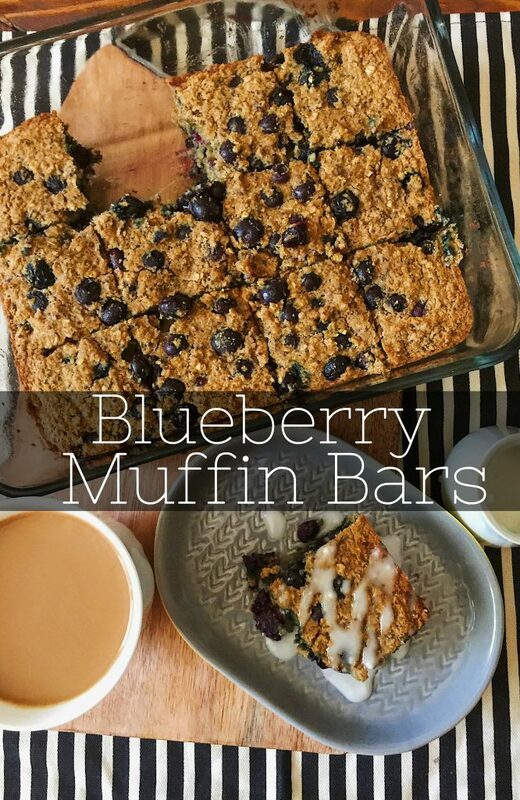 This bars sound so good and so easy for a quick breakfast or snack. 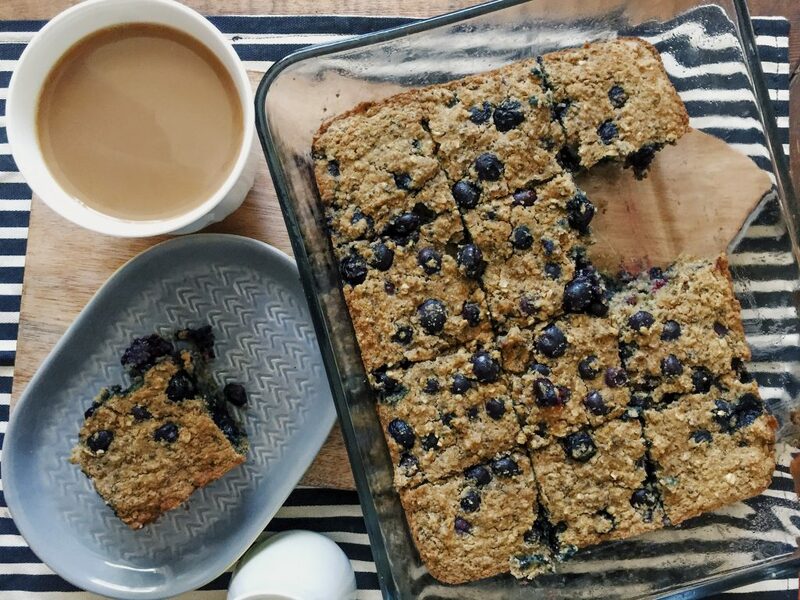 So easy and deliciousP:) & you can never go wrong with blueberries. YUM these look & sound phenomenal! I can almost smell the cinnamon! BUT I HIGHKY SUFGEST PEOPLE TO WATCH CABLE GIRLS BECAUSE THAT SHOW IS AMAZING! So much blueberry deliciousness! I love the summer months when berries are actually affordable! Plain Greek yogurt filled with blueberries is one of my favorite post-workout snacks. I love that these are so easy to grab and go too. And I prefer making my own treats like this because I actually know what’s going in them! One of Ben and I’s favorite ways to make up recipes is to do a date night Chopped (thanks Food Network!). One of us buys the ingredients (but keep it secret! ), and then we put it in a ‘basket’ and the other person has to figure out a way to create a dish on the spot using all the ingredients and whatever’s in our pantry! The other person doesn’t get to peek in the kitchen until they’re done. It’s SO fun, you never know what you’re going to get, and it’s an awesome and cheap date night :). I love making whole wheat banana pumpkin mini loaves at home. Still a delicious pumpkin treat with a fraction of the calories the loaves at coffee shops have. Currently binge watching Gypsy on Netflix! It’s the perfect show to pass the time on the long trains between regions out here. Me too 🙂 I couldn’t agree more! That is so much fun!! Kyle and I love Chopped!!! mmmm pumpkin and banana go so well together, and it’s so much better to make it at home. I agree! We started watching Gypsy but didn’t care for it! We watched two episodes and had to move on. Maybe it gets better! Might have to give it another try. Don’t give it another try haha now that I’m a few episodes in, I’m realizing it really isn’t going to get better! Can I use regular flour and sugar? Wow these look amazing!! ? I feel you on craving pumpkin everything! I loved loved baking your healthier pumpkin pie recipe last year for my family thanksgiving and ive been craving it again since! Ive never baked something on my own without a recipe, but i just kind of started baking/cookings. Id love to experiment more. Id love to come up with a really yummy/healthier version of gooey butter cake! We just finished bing watching Shooter with Ryan Philippe very suspenseful i highly recommend it ? I heard Shooter was good! 1.) 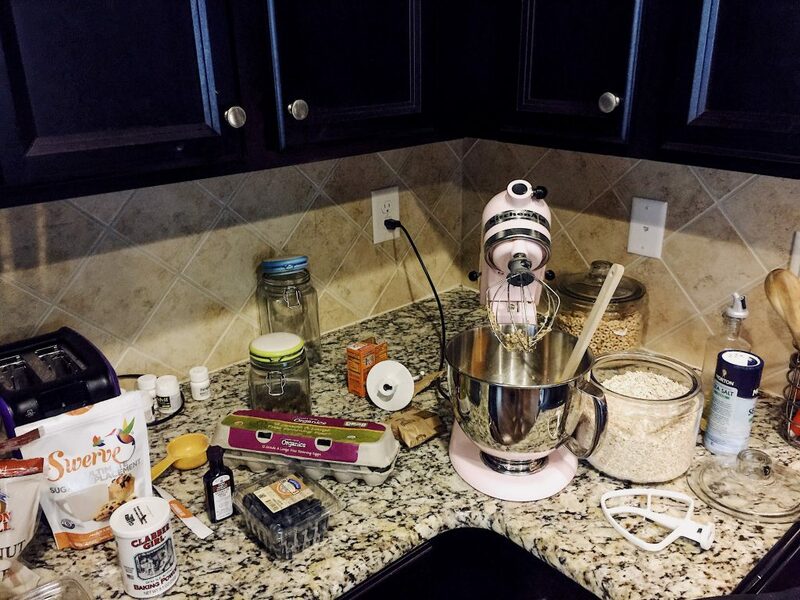 I’ve never made up a recipe…. only alter current recipes! 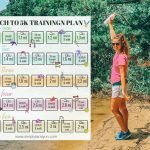 I’m not as creative as you! ? 2.) I love making Skinny Taste’s pumpkin scones from their cookbook. 3.) I am watching Riverdale for the 3rd time… love that show. Also finished Kimmy Schmidt! 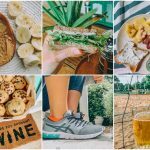 Question– Could I substitute almond flour for the coconut flour? Is there a conversion I need to follow? Ohhhhh I’ll have to look for that scone recipe!!! You could!!! xo no conversion. 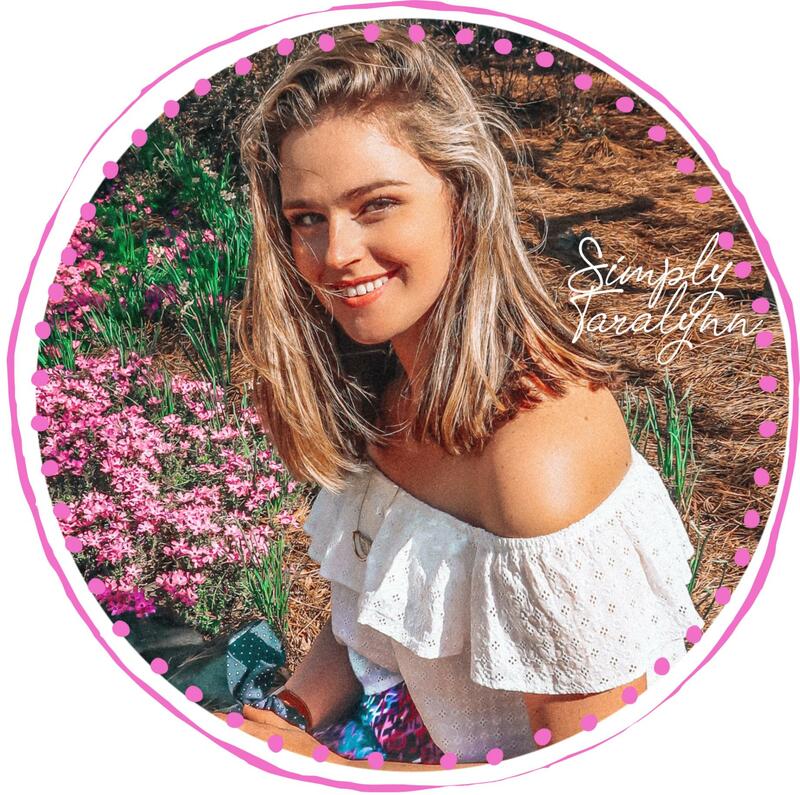 These look amazing, Taralynn – can’t wait to try them! They’re mine too and I always add extra! If we don’t have swerve or coconut flower, would gluten free flower and agave in the raw be okay as substitutes?